Issey Miyake L'Eau D'Issey Lotus blended with fresh ingredients. Issey Miyake L'Eau D'Issey Lotus 90ml. Eau De Toilette blended with fresh ingredients. Water cooling caress olfactory senses, which gets maximum satisfaction. Farsighted and dynamic aroma with a hint of natural subtlety with which you can present your unbridled nature. 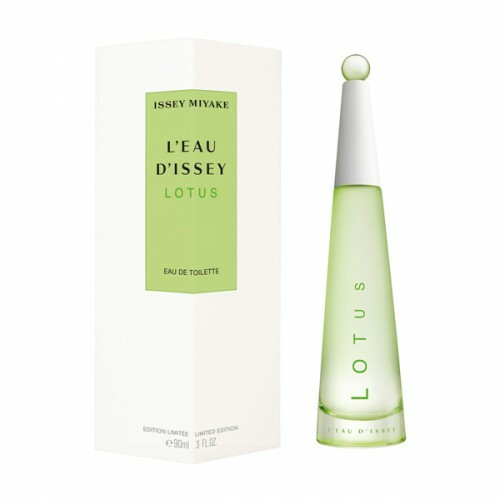 Issey Miyake L'Eau D'Issey Lotus's eau de toilette for women who love the morning dew. Water expression, behind which are hidden ingredients such as lotus, jasmine, hyacinth and many others. White appearance of nested folders to sing a sweet ode to nature. Falls under the spell of flavor that you will be very close. Vial of eau de toilette for women Issey Miyake L'Eau D'Issey Lotus has style. It's the particular shape of a cone whose tip is removed cap with the ball. Green hue that indicates what tones you can expect through the atomizer. It is a masterpiece dedicated to the morning dew, soft and beautiful chords lotus. This flavor of love, feeling and grace. The author invites you to enjoy a morning etude in Japanese style, a little bit of morning dew, sensual and loving chords Lotus (lotus, water chords) are replaced by floral ensemble with a dominant jasmine sambac, he sets the rhythm of love, but also the hyacinth is second to none lead, giving a graceful composition and youth (Sambac jasmine, hyacinth). Zephyr fragrance L'Eau d'Issey Lotus Issey Miyake is not overloaded, the author left only the most essential finishing touches to the sensuality and charisma of the entire composition was at a height; white wood provided nobility composition and its status, and white musk sang a song of eternal love and the great beauty of the east, which for many centuries is haunted by artists, poets and philosophers with a capital letter (white wood, white musk).